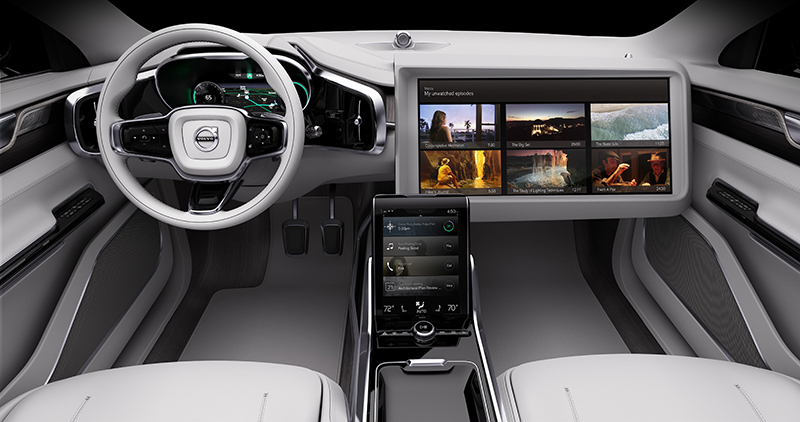 Volvo Cars unveiled Volvo Concept 26, an interior design concept and innovation platform for autonomous driving vehicles at the 2015 Los Angeles Motor Show. 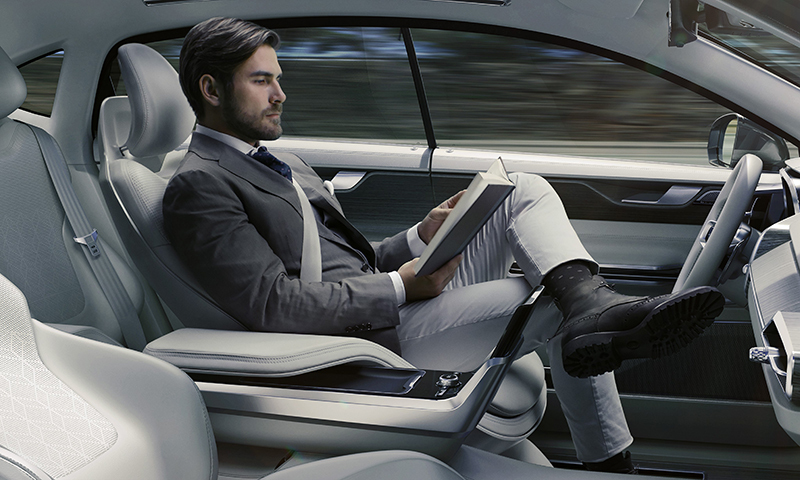 Volvo Concept 26 represents a new way of thinking about how luxury autonomous cars will integrate into daily life. 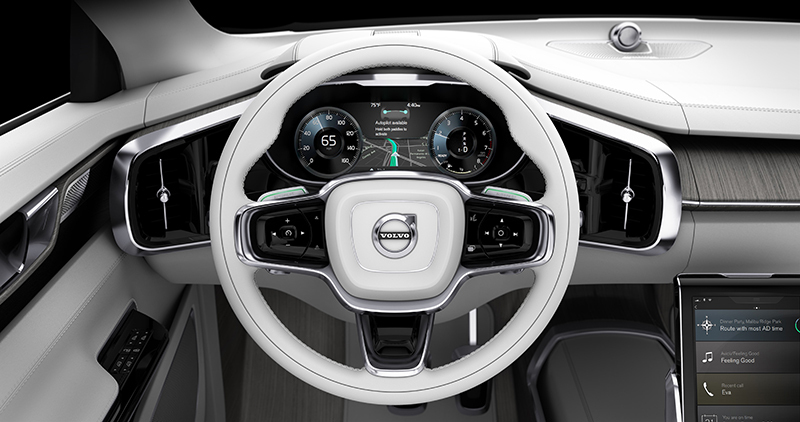 A result of extensive research on how people want to use autonomous driving and their time behind the wheel, Volvo Concept 26 provides various interior configurations that combine today’s needs with emerging trends and technologies to create a new experience when drivers no longer need to focus on the driving task. It is the first autonomous drive interior that is built on a vehicle platform available for sale today. “Volvo Concept 26 addresses the notion that driving can still be fun and liberating on the right day and on the right road but that some parts of driving, notably the daily commute in many metro areas, is stressful, frustrating and even broken. By providing drivers the choice of when to drive or delegate driving, we are able to retain the love and freedom of the open road while fixing the broken commute,” said Anders Tylman-Mikiewicz, General Manager of the Volvo Monitoring and Concept Center, the Volvo design center where Concept 26 was researched and developed. Research conducted by Volvo shows that drivers could reclaim a significant amount of time from their daily commute, and make that time more meaningful, when given an environment to do what they wish. In the United States many drivers could regain an average of 26 additional minutes for each commute and several hundred hours per year. In large metropolitan areas such as Los Angeles or New York, the time gained could be considerably more. In essence, Volvos equipped with Volvo Concept 26 will truly be “time machines”. “Concept 26 allows drivers to use their time in ways never before possible in a car” added Tylman-Mikiewicz. The concept is built around a patented and revolutionary new seat design that cradles the driver at all times and through the transformation between the different modes. Together with a tablet interface in the center console, a foldable tray table and a 25-inch flat-screen monitor that flips up from the passenger side dashboard, Concept 26 provides three interior modes: Drive, Create and Relax. Each mode offers a unique arrangement for drivers to maximize what they can do with their time while the car is in autonomous mode. Drive: This mode provides you with a great driving experience and minimizes driver distraction while driving manually. A true celebration of driving people love. Create: Volvo research indicated a variety of activities drivers wish they could do behind the wheel safely when they no longer need to focus on the driving task. Create mode allows for a variety of configurations of the seat, table and screens enabling the driver to complete a range of activities, such as reading, working on your next big project, or consuming media and other online content whilst the car takes care of the driving – always providing the driver with overall control. Relax: More than anything, a Volvo customer’s most valuable asset is their time. They seek experiences and products that allow them to recapture this time and make it meaningful. Concept 26 features a relax mode that transforms the seat into a comfortable reclining position. The vehicle can also curate and suggest content to the driver via the passenger dashboard mounted screen. Of course, sometimes the largest luxury of all is to just simply do nothing, relax and enjoy the ride. With these three modes as a baseline, Volvo Concept 26 creates a new autonomous drive innovation platform that can adapt to new needs and technologies over time. The company is working with several partners, and invites others to join, in creating the best space for consuming media, interacting with devices or relaxing. Volvo Concept 26 development was based on the company’s new Scalable Product Architecture (SPA). It is one of the first Autonomous Drive concepts that is built on a product platform available to buy today. As a company that prides itself in putting people at the center of innovation, Volvo is now leading the largest consumer conversation about autonomous drive at www.futureofdriving.com. Drivers from around the world are encouraged to visit and share their views of autonomous driving, which will help guide the future development in this area by Volvo Cars. Volvo will also continuously release more information about Concept 26 and other exciting products that will radically improve people’s commutes on this site.